Effective teamwork and communication are at the heart of employee productivity and job satisfaction. 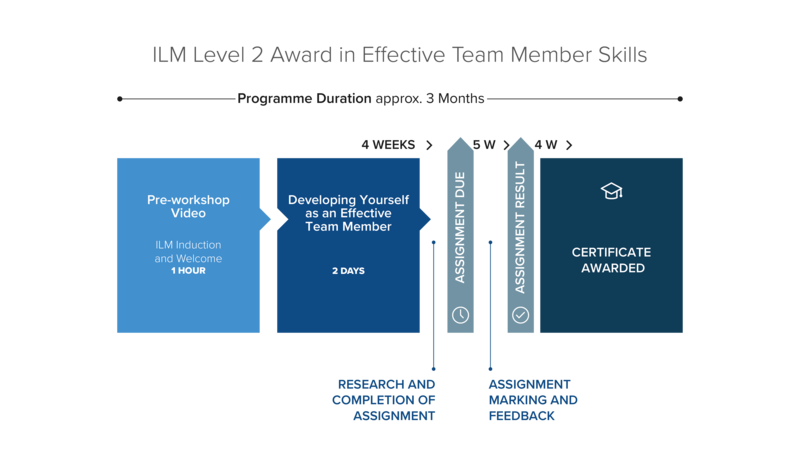 This programme ensures all team-workers have the foundation skills, knowledge and behaviours to make a valuable contribution to their teams. Programme duration approx 3 months, consisting of pre course work, 2 days classrooom training and assignments. This workshop is highly participative, using facilitated discussion, presentations, validated tools of self-assessment, case studies and group work. The workshop promotes reflective review, and encourages delegates to find opportunities to apply the learning in the workplace. Delegates will complete a work-based learning assignment, which is assessed and verified by the ILM to achieve their accreditation. This course is designed for anyone working within a team who is seeking an industry recognised qualification for their contribution. Identify actions for ways to improve the functionality of the team.